I went to see the Peter Brown exhibition in Bath last week. If you go make sure you have a listen to the free audio guide. I normally steer clear of them but the artist narrates it in a friendly style and gives great insights into his practice and how much he enjoys Bath and painting plein air e.g. 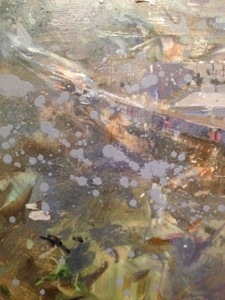 enjoying chatting to people during painting and finding it so sociable compared with the typical studio artist. There’s a talk by him at the gallery tomorrow (Mon 9th). For me I was a bit Bath stoned by the end of it and I’d have loved to see a wider variety of subject. He’s painted a variety of other places and I’ll be looking out for his next show. However in presenting a year in the life of Bath I’ve never seen so many red dots in my life before; mission accomplished, hopefully that’ll keep his home fires burning for a while. 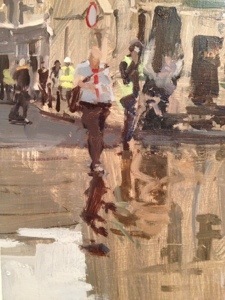 This entry was posted in Other artists and tagged bath, Peter Brown, plein air, Victoria Art Gallery by ianpriceart. Bookmark the permalink.